NETWORK FINALS: HAWAII 5-0 lost 0.1 in final numbers. CABLE HIGHLIGHTS: ESPN’s NBA doubleheader led Friday cable at 0.76/0.75. On Discovery, GOLD RUSH dropped 0.09 to 0.69, and ALASKAN BUSH PEOPLE returned at 0.35. 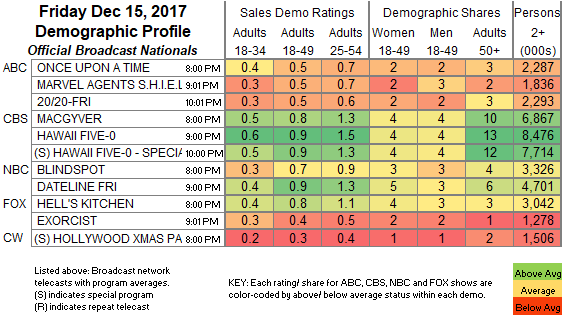 A&E’s LIVE PD gained 0.02 to 0.58. On Bravo, DON’T BE TARDY ticked up to 0.35, and MARRIED TO MEDICINE was up 0.02 to 0.33. MSNBC’s RACHEL MADDOW SHOW led cable news at 0.28/0.43/2.6M, above Fox News’s HANNITY at 0.23/0.39/2.9M and CNN’s ANDERSON COOPER 360 at 0.23/0.29/1.1M. On Bravo, THE RAP GAME ticked down to 0.27, and BRING IT was down 0.02 to 0.26. Nickelodeon’s afternoon TOP WING was at 0.27. Cartoon Network’s STEVEN UNIVERSE was at 0.25, and TEEN TITANS GO was at 0.24. On HGTV, HOUSE HUNTERS climbed 0.09 to 0.25, and HOUSE HUNTERS INTL was up 0.06 to 0.23. 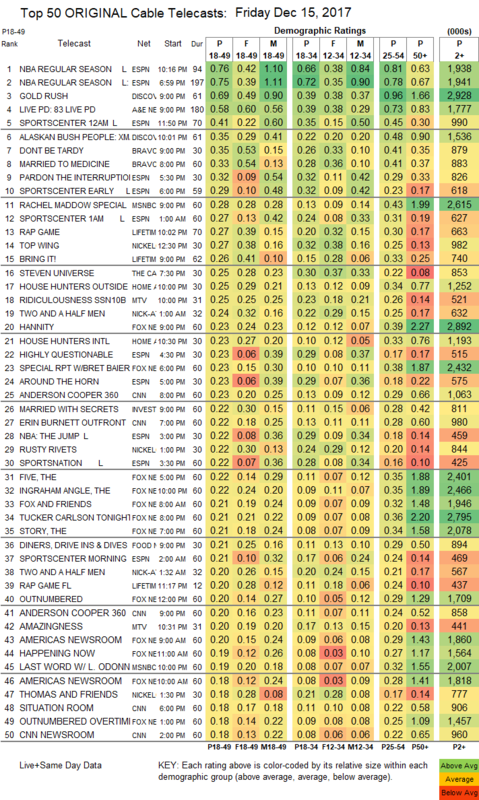 On MTV, RIDICULOUSNESS was at 0.25 compared to last week’s 0.26/0.22/0.19, and AMAZINGNESS was down 0.03 to 0.20. Food Network’s DINERS, DRIVE-INS & DIVES lost 0.03 to 0.21, and GRILL DADS was at 0.15. The back-to-back season finale of Syfy’s Z NATION was at 0.16/0.15, compared to last week’s 15. Spike’s BELLATOR was at 0.15. We’s MARRIAGE BOOT CAMP held at 0.13.